Syllabus of the Online Course (Subject): Zhang Ruimin “Confucian Businessman” (China). Learning materials in or Zhang Ruimin Zhang Ruimin. Zhang Ruimin is the President and Managing Director (CEO) of the Haier Group, a Chinese multinational corporation with a turnover of 17,500 million dollars. Previously; he was the Vice President of the company Appliances Qingdao, Zhang Ruimin was elected to Director of the Qingdao refrigerator factory in 1984. Since then, his “branding strategy” has transformed the small collective factory of Haier, which was in bankrupt on a multinational corporation that last year had a turnover of 17.5 billion dollar. Founded in 1984 in Qingdao (People's Republic of China), Haier has experienced an annual increase of 82% of its turnover in just fifteen year. Haier is one of the largest household appliances and electronics devices manufacturers in the World. Haier has sixty-four business offices, twenty-nine production plants, eight design centres and sixteen industrial parks in the World. 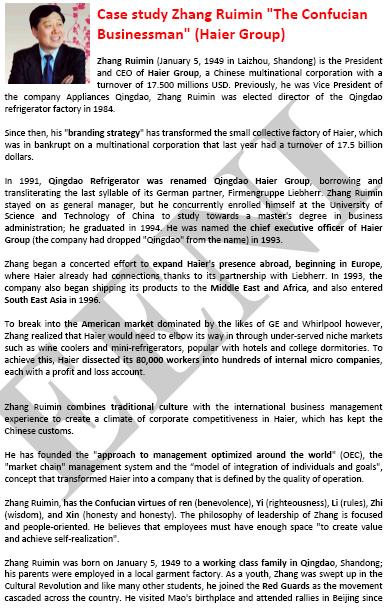 Zhang Ruimin (1949, Shandong) combines the traditional Chinese culture with international business management experience to create a climate of corporate competitiveness in Haier, which has kept the China Customs. Zhang Ruimin, the Managing Director (CEO) of Haier, believes that the essence of globalisation is localisation. This translates into a framework of operation “three in one,” based on the full localisation of design, production, and marketing. “If you have influential family connections, and your father has comrades in arms who are now senior officials and which “can remove the face for you,” you can do what you want. However, my father only had some workers colleagues and not comrades in arms.” Mr Zhang Ruimin. The honesty proclaimed by Confucius is that Zhang used to dealing with people and is the basis for the Haier corporate culture. People think that the wildness and the fight for the money is a natural result of the market economy, with which China has replaced the former planned economy in the last two decades.